This looks so good! I love the idea of maple syrup and the sesame sticks. I would have to use wheat chex for some of the rice chex. I have been known to be guilty of picking the wheat chex out of chex mixes. I don’t have curry paste, but have curry powder. Any chance for a substitution? BTW, I bet this smells incredible while it’s baking! hehe, very interesting about your chex mix conversations. In my anthropology classes we would have called that folklore – a food tradition or memory that is passed down through generations and for which everyone has their own, unique variation. I have never made Chex mix, nor do I remember my mom making is but maybe she did…Now I’ll have to ask! uggg. I wish I didnt snack. Love this mix!!! beautiful photo too! chex mix w/ just one kind of chex? that isn’t right :) funny isn’t how sometimes we are so used to the version of something we had growing up that we are sure that is the only way to make it. my mom’s version had the rice, corn and wheat. my favorite was the wheat – lucky for me since others seemed to like the other two more. 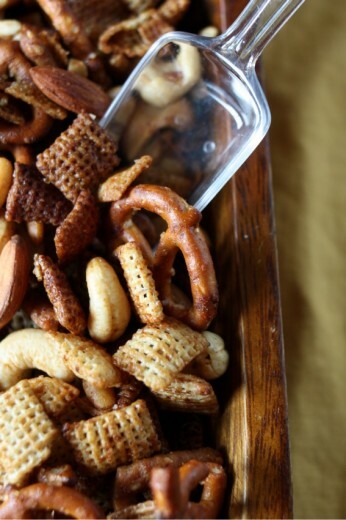 My grandma used to make Chex mix every year at Christmas. TONS of it. She would use corn, rice and wheat chex, pretzels and all kinds of nuts. Almonds, cashews, brazil nuts, peanuts. The flavor was more salty, garlicky (?). I like the idea of salty/sweet that you have here. Our Mom made chex mix and my brother has perfected the art. When his youngest daughter got married there was a HUGE bowl of her Dad’s chex mix at the fancy wedding reception! I’ll be honest, I actually don’t snack either. I mean, I suppose I do if you count nectarines, plums, peaches and apples…but I don’t mindlessly snack. Probably because in college when I mindlessly snacked (Chex Mix was certainly a culprit) I gained the freshman fifteen (and then some). 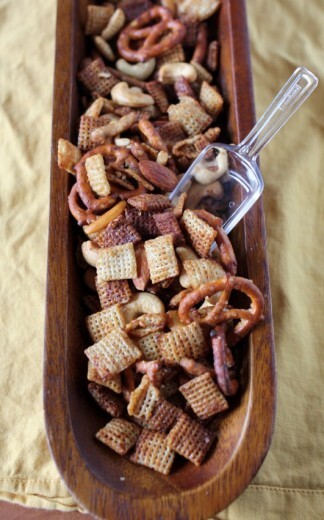 But for parties and such, this Chex Mix does sound perfect. I think you’ve hit on all my favorite flavors in this! I snack way too much, but I usually only have one large meal a day. I made a sweet version of chex mix not too long ago and I realized that I don’t crave it nearly as much as the salty version. This recipe sounds more to my taste and I love that you added a bit of spiciness to it. 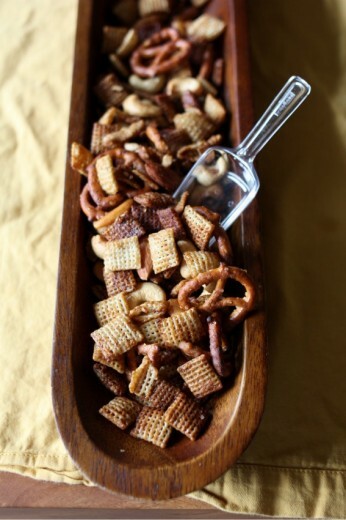 It takes a confident foodie to post not one, but two recipes for Chex mix–love it! Do you have a chili con queso recipe that includes Velveeta? Love the thai curry paste, creative addition. Thanks, Dana! Um…98 shrimp skewers? I have a big appetite… but whoa.